The Kingdom of Bhutan is a small nation tucked into the mountains north of India and east of Nepal. It has a population of less than 700,000 people and no traffic lights. It is illegal to sell tobacco or engage in mountaineering in Bhutan (one is bad for health; the other might disturb mountain gods). Forbidden also are fishing and hunting. This small country produces two excellent beers – Druk 11000 (which comes in a big – 650 millilitre – bottle, contains 8 percent alcohol, and packs a smooth punch), as well as the weaker, yeastier, Red Panda. And wine? Bhutanese produce ara, made predominantly from wheat, although rice or barley are also used. This ‘wine’ might be what we call ‘moonshine lite’ in the United States, and is produced on the sly in villages. Is it really wine? Technically, no. But that’s no reason to stop a good story. Before telling of the satisfying hunt for ara, here’s a little background skivvy on wine made from wheat. Technically, wine is produced from grapes or other fruits. Sure, you can add wheat as a clarifying agent to white wine, or add wheat to provide additional tannins in red wine. But wine without fruit? The Japanese drink Sake, which is made from rice and sometimes referred to as wine. But most definitions of wine state that the basis is fruit. I found an internet recipe for ‘wheat wine’ that includes taking one pound of wheat and adding sultanas, potatoes, and grapefruits – but the sultanas and grapefruits are fruit, so their contribution makes this ‘wheat’ beverage a wine. However, since locals and visitors to Bhutan refer to wheat based ara as wine, I’ll do alike for this piece. 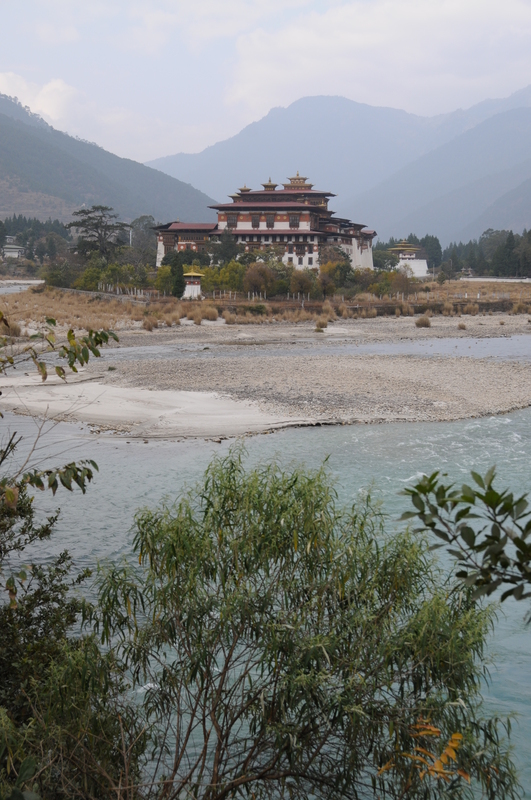 In order to travel within Bhutan as a foreigner, you are required to have a guide. This is supposed to help enhance visitors’ experience. 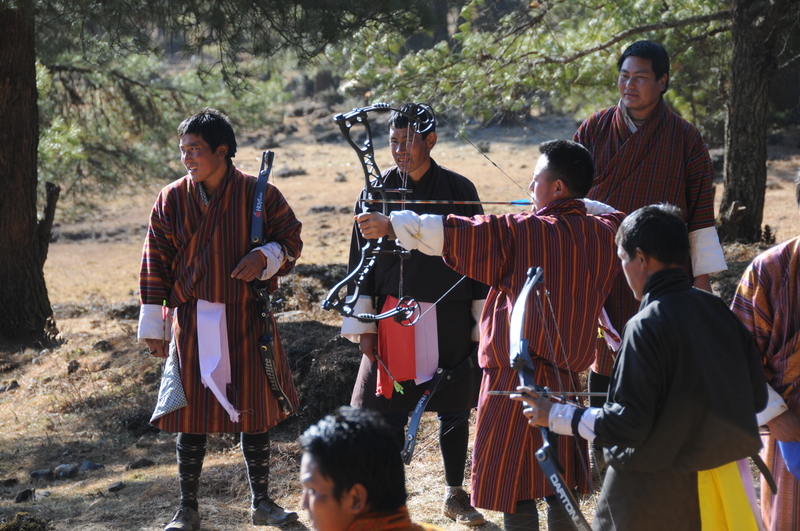 I told my guide, Mr. Tshering, that I wanted to discover more about Bhutanese ara. 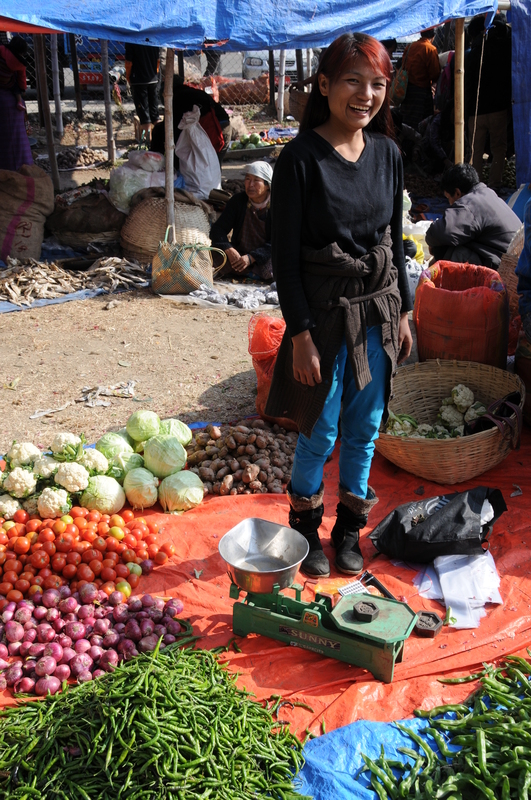 First, we visited the local market within the city of Punakha. Very colorful. After this visit, we drove fifteen minutes, parked along a roadside, and began hiking. 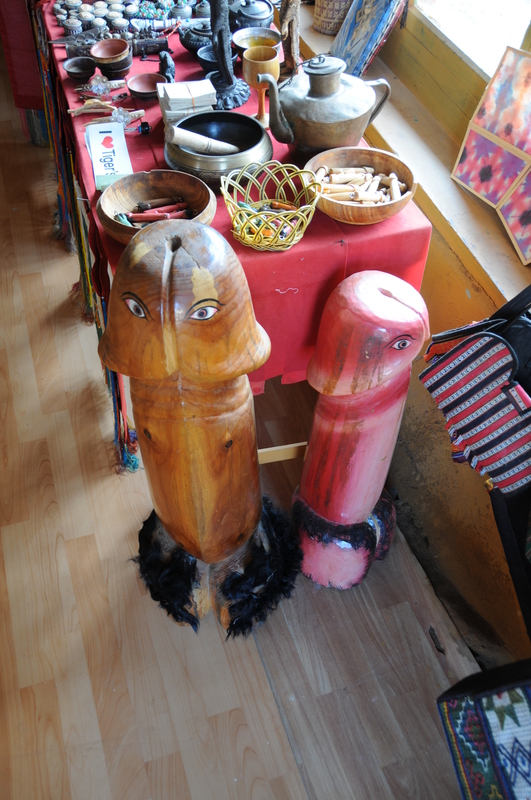 We soon passed a store selling wooden phalluses. Apparently an ancient and deified hero of Bhutan known as the Divine Mad Man came from Tibet. His sexual prowess and reputation for philandering were legendary. So when four spirits were found to be maligning the people who crossed Dochula mountain pass, the Divine Mad Man was summoned to solve the problem. He used his powers to rid the pass of demons. Today, in a show of apparent gratitude, images of penises riddle the countryside: over store fronts, poking above bar doors, painted on buildings. 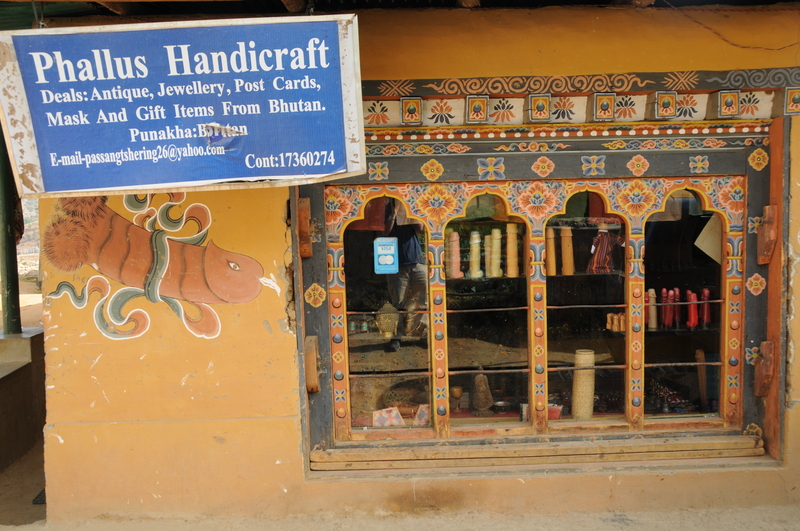 After passing the Phallus Handicraft store, we walked past a water powered prayer wheel – sending prayers to the heavens. When I asked Mr. Tshering whether a site for wine making was ahead, he told me no, that we were going to the Temple of Fertility instead. Apparently both Mr. Tshering and our driver, Mr. Sonma, considered my bachelorhood as a condition they needed to help rectify. Although, considering that both men are bachelors, I suspected they sought a little temple magic themselves to change their own personal situations. So we ascended a mild hillside toward the temple, all the while passing multiple Bhutanese couples also en route, dressed in traditional long robe clothing – khera for women, and gho for men. A monk headed for the fertility temple? Once there, we spun multiple prayer wheels with our hands, took off our shoes, entered the temple, bowed and said prayers before an image of Buddha, received a blessing from a monk, and returned to the car. On the way we passed laughing and gracious children. But what about the ara, I asked Mr. Tshering. 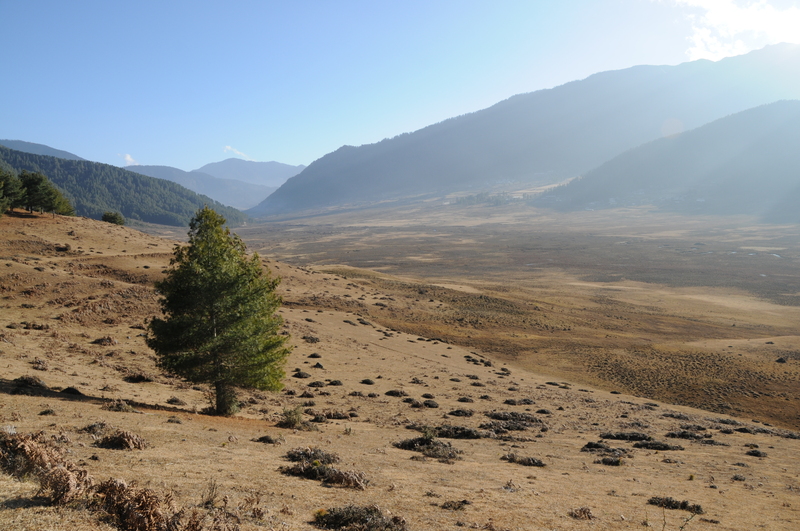 Days later, in the town of Chamkhar in the central province of Bumthang, I told Mr. Tshering we should skip the planned afternoon trip to monasteries and instead just wander through town on foot, which we did. When we paced down one street we spotted Mr. Sonma, standing outside a tea shop and sipping a mug of chai. 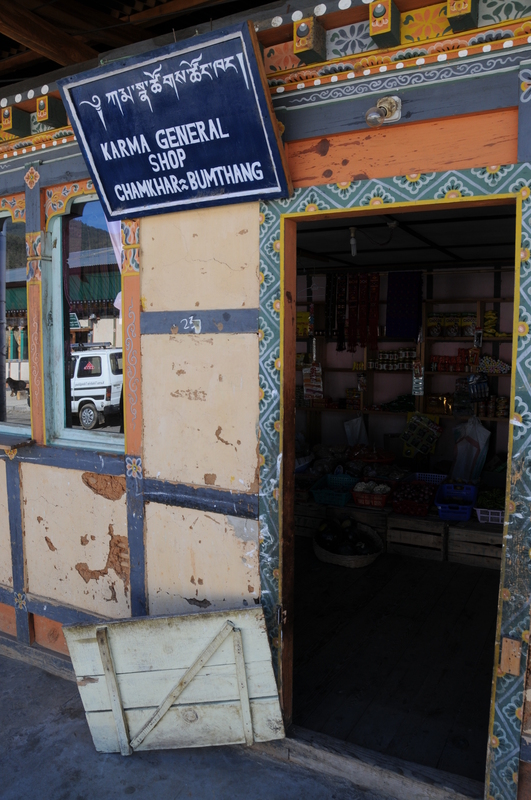 It turned out that the store belongs to Mr. Tshering’s brother. “Ara!” called Mr. Tshering. A woman drinking it laughed. She then asked for another mug and poured me a full helping. 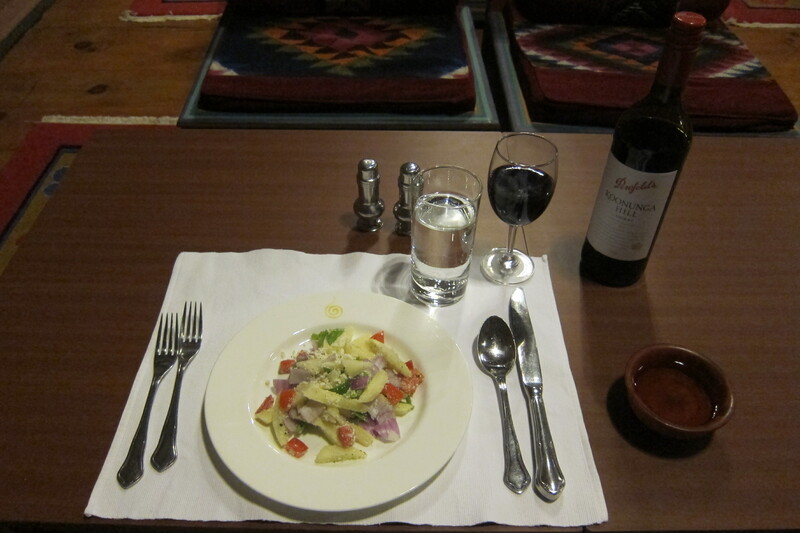 It was only 11.30 in the morning but, hey, I couldn’t refuse Bhutanese hospitality. So I took a few sips in the same time it took this woman to finish her glass and pour herself another. And then she burst into song and dance at this random wonderful little tea house/general store we happened across. The ara had the taste of mildly bitter lemonade. This mother of seven, wearing a nose ring made from gold, told us how the wine in the store is made at a local mountain village, and carried to the store in a big plastic container (Mr. Sonma fetched the empty container from the kitchen to display). Apparently ara is drunk by villagers at any time of day – the sugar helps keep them warm while working in mountain fields, and the alcohol dilates their capillaries, flooding their extremities with warm blood. This woman rapidly downed two glasses, after which the shopkeeper topped up her bottles free of charge. He told me this was to keep her husband from asking whether she had already sampled the wares while on her way home. 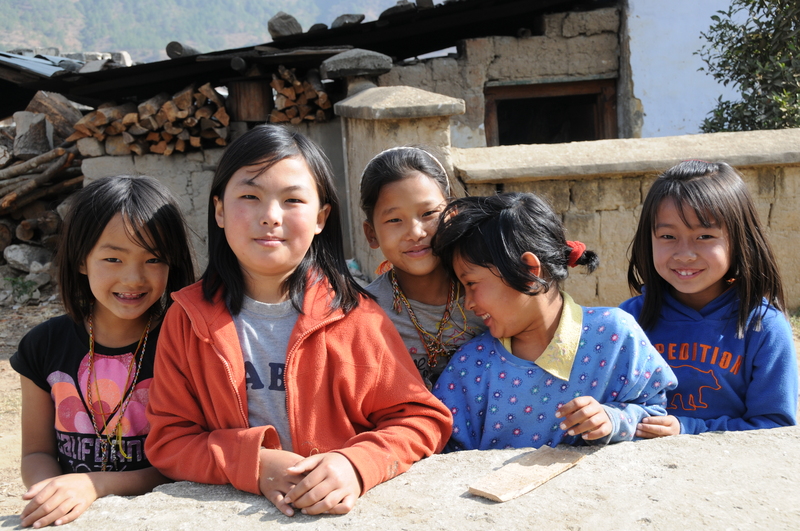 Buzzed and happy by the encounter, my Bhutanese friends and I set off walking again. They insisted that I get some rest. After all, they said, that night was New Year’s Eve, and we would be going out drinking and dancing. 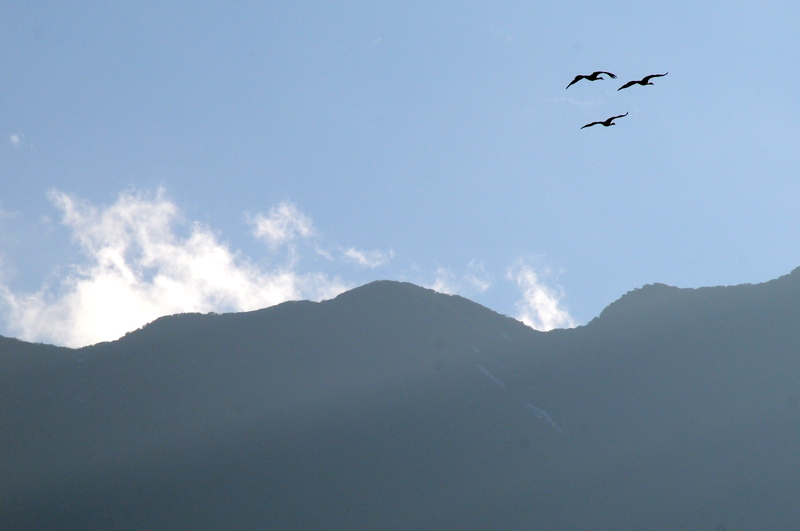 Days later, while hiking through the wide, beautiful Phobjikha valley at 10,000 feet above sea level (carved into a U-shape by glaciers long ago), we spied and photographed rare black necked cranes, watched locals practice archery, then met a farmer who invited us into his home. After ascending steep wooden stairs, we sat. Our host, Mr. Dau, poured us his homemade wheat-based ara, likely 16 to 20 percent alcohol and particularly smooth to drink. Although technically ara might not be wine, the alcohol content brings it into a range above beer but lower than more potent alcohols. As a lunch time drink for workers who are toiling in the field, it’s delicious, nutritious, and always seems to help strike up camaraderie between the easygoing, peaceful Bhutanese. 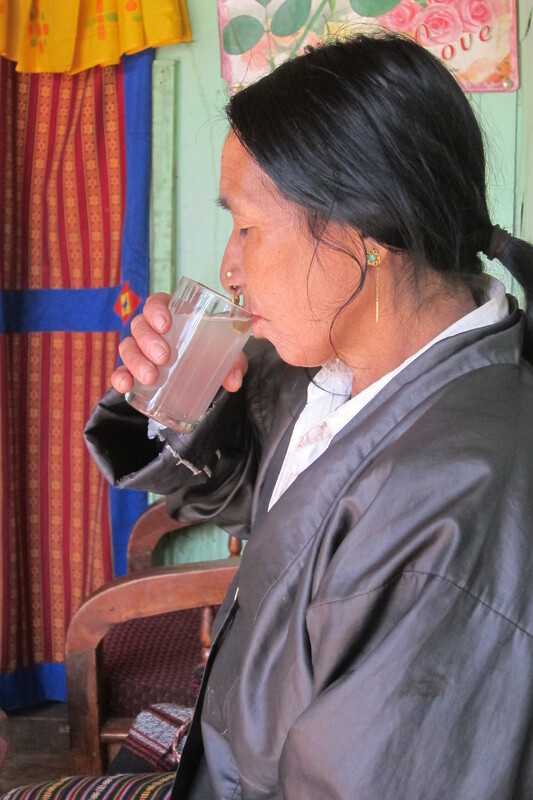 Ara is not only a daily drink for field working villagers, but also a national beverage with pedigree. On request, I was served a helping of ara in a handsome mason bowl within a Thimphu city hotel owned by the royal family. Ara is also the name of the bar at one of the pricier resorts in Thimphu. 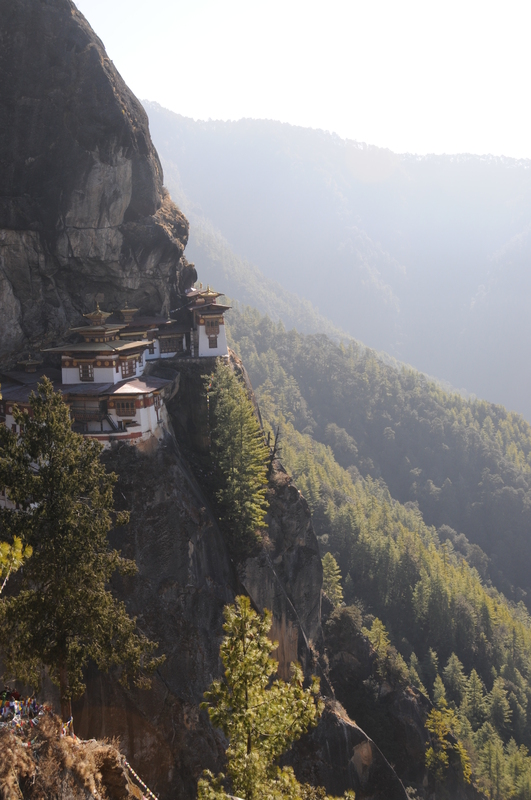 Of course, fortified or not by ara, any visitor to Bhutan will want to view or hike to the Tiger’s Nest, built after the original Guru Rimpoche – spiritual leader of Bhutan – received a vision for building the monastery in the seventeenth century (after transforming himself into a flying tiger and cruising through the air to the location from the east). This spectacular monastery was built in the late 1600’s. Magnificent. Here’s to trying new wines and experiences in 2014. Thanks for the journey into a country (and a wine) that I know very little about Tom! Amazing photos. Looking forward to following your adventures in 2014 – where to next? Thanks Chrissie! Looking forward to more of your excellent posts this year also. Next? Jazz festival in St. Emilion in France this spring! Hope your travels down under go well. When do you head south? Lovely, what a great combination wine & jazz 🙂 Heading home at the end of the month. I’m thirsty for Australian wine!! Can’t wait to get properly stuck in and see what beauties I uncover!! Cool….and we’re all lookin’ forward to reading about it! Fantastic trip, beautiful imagery and people. Love the store – reminds me of little African ducas. Ara sounds intriguing. Yes, Alex….I was so fortunate to have a very easygoing and accommodating guide/driver combo. Wonderful people in a jewel of a country. The leaders really want the best for their people too. Fantastic! Love the video too, you should do more of those. Puts you right there in the action. Thanks….brought the video camera and tripod but never used them….just the still cameras (one with a video function). My mind is still in photo mode. That will change with time!